We might be the remarkable duck people but that doesn't stop us from enjoying other delicious poultry too. Our quail are grown and packed on farms and factories in France. Try quail with bacon and redcurrant sauce. 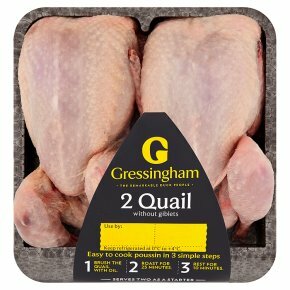 Easy to cook poussin in 3 simple steps 1 Brush the quail with oil. 2 Roast for 25 minutes. 3 Rest for 10 minutes. Pre-heat your oven to 190°C, Fan 170°C, Gas Mark 5.1. Remove all packaging. Brush the quail with oil.2. Place on a roasting tray with a gap between each bird and cook for 25 minutes.3. Rest for 10 minutes before serving.All ovens vary in performance, this is a guide only.